MCBS offers dedicated finance and accounting services to help clientele grow, manage their finance and accounting operations. It provides Accounts Payable (AP) services using automated processes and workflow management and reporting tools that cut down discrepancies while affording improved financial control. With the correct blend of processes, procedures and technology, MCBS creates a modular approach in AP management. Its AP solution consists of an integrated suite of services that streamline, automate and web-enable accounts payable functions. Timely issuing Purchase Orders and recording them enables to manage back orders and ensures receiving better credit terms from suppliers on daily basis, thus helping in maintaining better cash flow. Doing entries timely for payments made to vendors helps to maintain the accounts payable aging up to date and minimize the risk of overdue payables. It helps the business to determine cash requirement by showing accurate due payables. Reports are generated to show the amount due to individual vendors to reflect the payable position of the business. Ageing reports can be generated to show the amounts payable as on a specific date. The excellence gained through working closely with diverse industries such as manufacturing, transportation, trading, automotive, surgical products, e-Commerce and entertainment stands us in good stead. 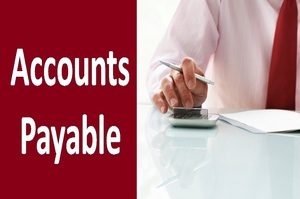 Whether you desire to outsource your accounting department to bookkeeping firm or need assistance in a specific area like accounts payable, our highly skilled accounting professionals can assist you with the day-to-day tasks associated with your accounting needs.